Bicyclist Protection Archives - PPP, Inc.
Jupiter Florida is much like any other city in the United States. Each morning millions of school kids are dropped off to begin their day of learning. Carefully monitoring and shaping motorist behavior is of the utmost importance when protecting kids coming or going to school. Rodney Carroll, Utility Service Supervisor has paid particular attention to the crossing at Jupiter Middle School located at 15245 Military Trail Jupiter, Florida. At this location, many drivers instinctively wanted to turn left when exiting the school. While this may not have been against the law, it did cause traffic backups and a safety issue during peak drop off or pick up periods. As a result, the solution was to install individual posts like the one shown in the illustration below. This forced exiting drivers to turn right and keep traffic moving. As an added benefit, the posts also served as a traffic calming device to keep speeds down. “We thought we had the problem solved and initially the posts looked great. However, we quickly learned that the product we used just wasn’t up to the task in this environment. Our crews were out there every week replacing a handful of posts that have been impacted. While I expected to replace some over time, this was way more than I anticipated. Between the $35 post itself, adhesive and the crew time, it became a burden. The cost was adding up fast. Not only were our crews getting frustrated, so were drivers because we had to set up work zones every time we were on-site which disturbed normal traffic patterns. Because of all this, we decided we needed to look for another cost effective solution.” says Carroll. Beginning In March of the previous year, representatives from PPP met with Carroll to discuss new and innovative products in the transportation safety industry. “We listened to Carroll and his team’s concerns and had a couple of innovate options that we felt would be effective.” says PPP’s Pedestrian Protection Specialist Jake Harris. Carroll recalls “I liked a few things they showed me, but I particularly liked that ORCA product.” At that time the Orca Lane Separator was new to PPP’s innovative offerings here in the US. “We focus on safe, smart, simple solutions that can be an effective countermeasure for a cross section of high priority traffic safety issues” says Greg Driskell, president of PPP. 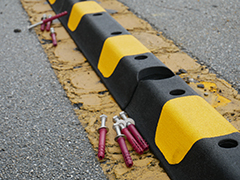 The Orca system is a longitudinal lane separator that is designed to provide as permanent or removable in-road curbing. But unlike others on the market they have a narrow footprint and proven high durable flexible delineators. 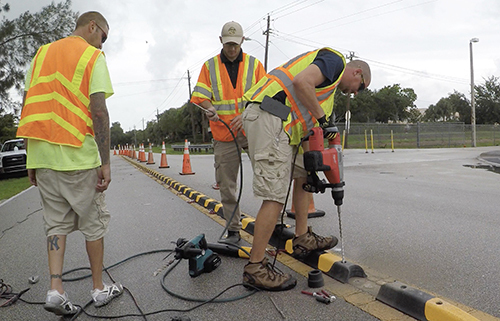 “Being in the traffic safety business for decades, we know that when it comes to the roadway, every inch counts, the Orca’s 7inch wide footprint allows agencies to install it without re-engineering the roadway.” Says Driskell. “We use the Orca for many applications like bicycle lane delineation and access control, but we’ve began to see a trend in its use for improved traffic management in school zones as part of the Safer Routes to School initiatives.” says Harris. The ORCA is made from upcycled truck tire tread and a 2-part polyurethane binder compressed at 160 tons. The result is a durable material that can be stand up to the tough roadway environment Carroll appreciated the raised 4 inch profile that when impacted, will direct car tires back into the lane they came from. 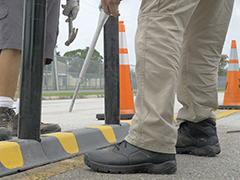 Combined with the robust heavy duty polyurethane Orca flexible delineator posts, it is becoming a popular combination for agencies across the United States. Weather in South Florida during the summertime can be unpredictable …. and wet. It was clear on installation day that rain was going to be an adversity the crew had to plan for and suffer through. Jake Harris and Greg Driskell from PPP were on hand to offer any technical assistance needed and to document the install. Having all the materials they need in just one standard Ford F-150 pickup truck, they began unloading right at 9am at the project site. In just minutes the product was laid out where it was supposed to be, fitting perfectly between the double yellow marking in the center of the roadway. The installation process includes drilling, blowing out holes of debris, injecting resin and screwing in fasteners. The team settled into a rhythm having an assembly line of sorts and ahead of schedule, the job was complete. Carroll adds ”I have two pieces of advice for my colleagues that will install this product in the future. First, take extra care of the lay-out and drilling of the holes, If it isn’t straight, it will look odd and the posts line up well with the Orca curb. The other thing we learned is that the roadway surface should be scraped clean of things like excessive butyl or marking materials. The flat surface will insure that the posts line up and it will be a clean uniformed job.I sent two guys ahead of our assembly line with prybars and scrapers to remove excess butyl left over from the previous products installed. Overall, I thought it was pretty straightforward. It looked great. In fact as you can see from some of the pictures, it accentuated the sub par condition of the markings. I couldn’t let that go so the next week, our guys went out and restriped. ” According to Rodney Carroll, the application of the Orca reduced his concerns by more than X%. Insuring that safety is dramatically increased with out excessive costs. The Orca Lane Separator is Safe, Smart, Simple.